In the Company of Dogs is a dog lover's as well as a dog owner's best friend. If you want a dog catalog that has the most fashion forward accessories and apparel for the dog in your life, you won't be disappointed with In the Company of Dog's collection of dog pillows, carriers, leather dog harnesses, collars and fashion forward dog clothing. 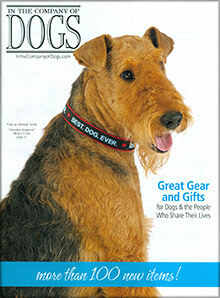 In the Company of Dogs - Whether you need a dog carrier for your Scnhauzer, a colorful or leather dog harness for your Shitzu or dog id tags for your Sheltie, In the Company of Dogs is the dog catalog that carries the best of the best when it comes to all things dog friendly. Leather dog harness and accessories - Walking your dog can be a total walk in the park with dog harnesses, dog collars, leads and leashes from In the Company of Dogs dog catalogs. For a small dog harness for your toy poodle or a large dog harness for your Doberman, choose from leather dog harness designs, step in harnesses, back harnesses or freedom harnesses that ensures your dog's complete comfort! Doggie clothes - In the Company of Dogs is the fashion dog catalog of choice for the canine elite featuring a selection of stylish dog coats, dog jackets, dog hoodies, tees, parkas and sweatshirts. In the Company of Dogs even has designer dog harness vests that make a chic statement while cruising the neighborhood. Dog beds - Flip through the In the Company of Dogs dog catalog for doggie beds that will have your pet sleeping in absolute luxury. From small dog beds to large dog beds, therapeutic, travel and waterproof beds, treat your dog to a good night's sleep with a collection of beds nestled in the pages of one of the premiere dog catalogs. Gifts for dog lovers - Give 'em something to bark about with a sweet collection of dog themed gifts for dog lovers! Gift them with dog ornaments to hang on their tree for the holidays or doggie themed apparel and jewelry featuring Man's Best Friend himself! In the Company of Dogs catalog even has doggie print pajamas, slippers and robes in case you're up for a doggie slumber party! Whether the pup you love needs a new large dog bed or a bag of gourmet doggie treats, grab a hold of that leather dog harness and start shopping because you're in good company when you're In the Company of Dogs.